Power mat has teamed with Duracell to make this charger. Just leave phone, with its special charger case directly on surface and charges automatically. Now that iOS syncs via Bluetooth, this product is finally ready. $99.00 and available now. 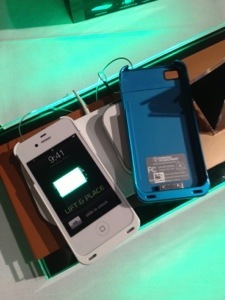 Includes the mat, backup battery/mat and special case in white or black. Other colors available at $35.